i hope everyone had a wonderful thanksgiving weekend! now that the turkey and mash-potatoes are gone, the christmas tree is finally up, and the holiday baking has begun (i think i've already eaten a dozen of these yummy cookies!) it's time to kick the handmade gift making into full gear! while i may have been pushing a few sewing deadlines off .:ahem:. the heat is on. so to kick it all off, and to get the creative juices flowing, i decided to make a quick little lined drawstring bag using jeni's awesome tutorial! i just love this tutorial! jeni's pictures and instructions are clear and precise, making for a wonderfully easy tute to follow. 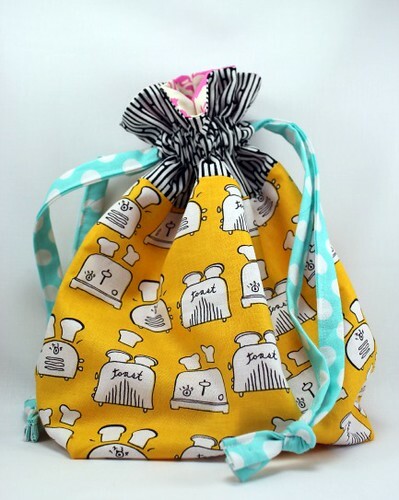 for my bag, i decided to use some of my yellow "toast" fabric and a geometric black & white fabric for the outside. i just love that toast! 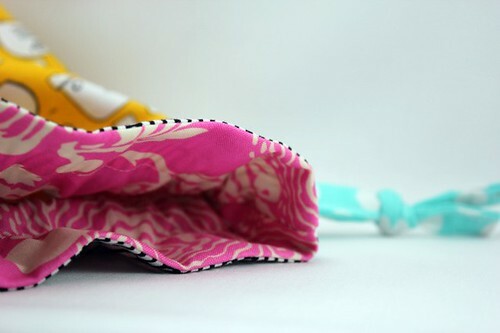 for a little pop of color, i used a hot pink amy butler print for the lining and a contrasting aqua dot for the draw strings. 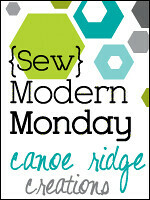 do you have a recent modern sewing finish? then be sure to link up! as always, please include a link and/or button in your blog post so everyone can know where you are partying! Love your Toast bag. What a wonderful idea! The toast bag is so cute!! Love the lining. 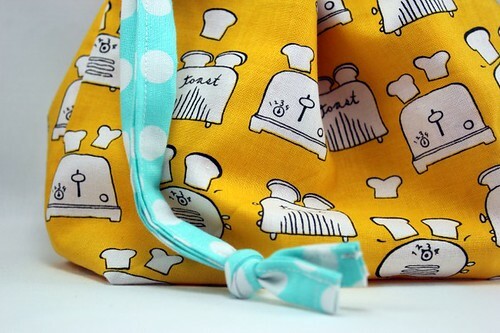 Love the toast bag - co cute:) A friend of mine asked me to make her a toaster cover a while ago - it would look amazing in this fabric!! LOVE that fabric!! :o) So cute. Hi Megan! Great bag and what a funny fabric! Have a lovely week! 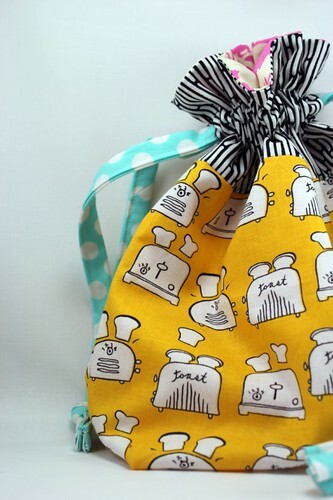 Thanks for hosting, Megan :) Your little bag is adorable... that toast fabric is perfect! Jeni's tutorial has been on my list for a while. Love it! Your toasty bag is awesome! I'm hoping I can try Jeni's tutorial before the end of the year. Thanks for hosting! Hopefully, I can make it part of my regular Monday routine! So cute! And your light box is working wonderfully - great photos!! GAW!!!! That is so cute!!!!! LOVE that little bag, it's super cute! Love your bag. I made a ton this weekend, too! Hee hee, I love that toaster fabric! Really must stop brain farting and posting my finishes on Sunday and hook them up on Monday though - mental head slap!